Whether you’re chilling out after a day of theme park fun or ready to hit the spectacular pool, each of our room types offer everything you’ll need for a cool vacation. A welcome retreat for 4. this inviting 314 square foot room offers two queen beds, separate bath and vanity areas and a wealth of exceptional amenities. Your peaceful 238 square foot tranquil hideaway sleeps 4 and is here when you return from a day in the parks, offering you a beautiful, comfortable king bed and a pullout couch, separate bath and vanity areas and the latest modern conveniences for the utmost in relaxation. 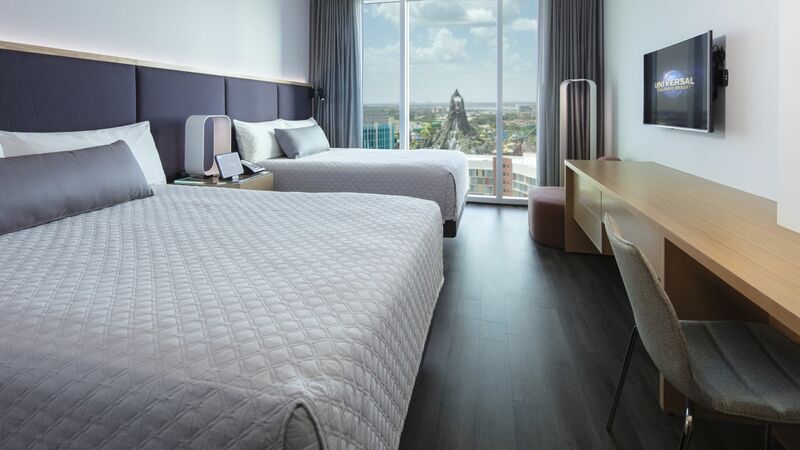 Your room is on the highest floors of the sleek tower, with sweeping views of Universal Orlando Resort or the city of Orlando. These 314 square foot rooms sleep 4 and feature two queen beds, separate bath and vanity areas and the latest modern conveniences for the utmost in relaxation. These serene rooms offer even more living space at 395 square feet and accommodate up to 4 guests. With views of the city or the parks, this room provides plenty of prep-time space and features two queen beds. These serene rooms offer even more living space at 395 square feet and accommodate up to 4 guests. With views of the parks or the city, this room provides plenty of prep-time space and features a king bed and a couch that converts into a deluxe, memory foam bed.